What is the Search in Video feature and how does it benefit the user? Technologies like the Watson Speech to Text service can easily convert audio and voice into written text for the quick understanding of content. 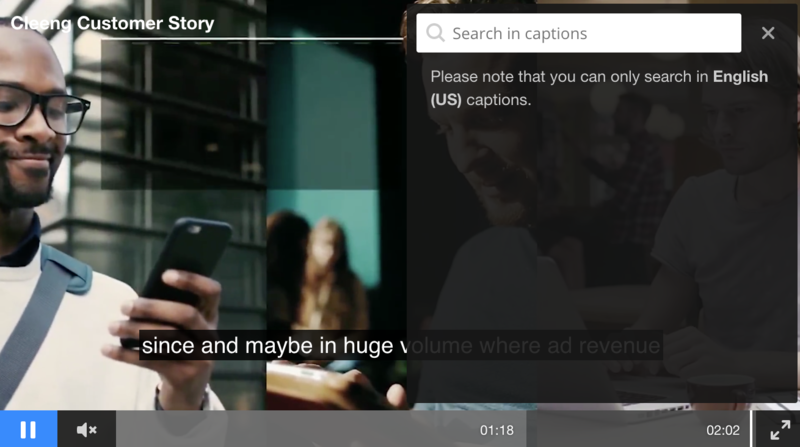 We created the "Search in Video" Video feature using the Watson Generated Captions (Watson Generated Captions for Video – IBM Watson Media Support) and other uploaded Closed Captions (Adding VTT closed captions files to videos – IBM Watson Media Support) to enable our users to search for a topic, term, name of a person, phrase or any spoken word in a video and navigate to the point in time of the video. Viewers can skim video content within a fraction of a second and find the most relevant parts that they are interested, without painful and time-consuming seeking. On which plans will the feature be available? 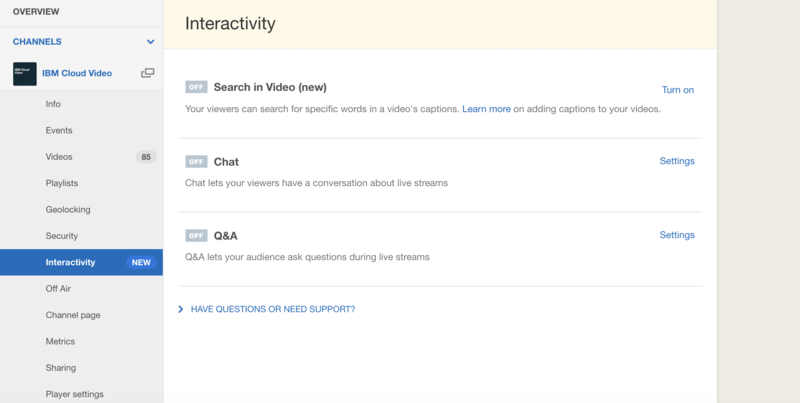 The Search in Video feature is available for all of the plans, where the Watson Generated Captions and Closed Captions features are available. A little search icon is appearing in the top right corner of the video player when the feature is activated for an account and there is a Watson Generated Caption or uploaded Closed Caption available for the video asset. By clicking on the search icon in the video player, an overlay appears with the search input field. 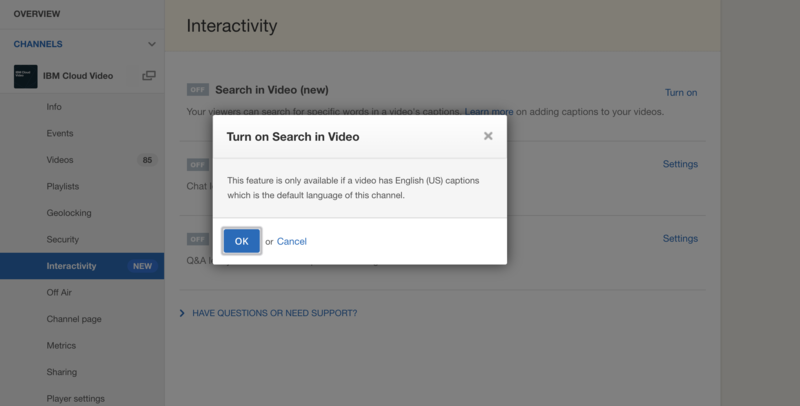 Users can search only in the default language of the channel when a Watson Generated Caption or uploaded Closed Caption is available in that specific language. When the user enters a search term into the input field, the results are listed in the overlay, together with the time stamps where the spoken word can be found in the video. In the search results, the complete line of the Closed Caption is displayed, giving the user a meaningful context where the search term can be found. The exact search term is underlined with blue. In the seek-bar, the search results are marked with blue lines, giving the user a general idea where and how often a given search term can be found in the video. By hovering over a specific search result in the list, the matching blue line in the seek-bar gets highlighted in orange, helping the user to connect and position where and when a word is spoken in the video. By clicking on a search result in the list, the video jumps to the time-stamp of the Closed Caption. 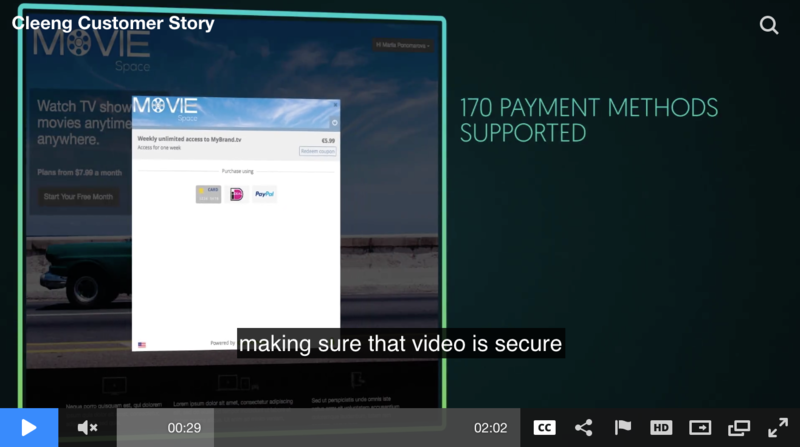 The prerequisite of the feature is a video asset, that has Closed Captions or Watson Generated Captions in the default language of the channel. If this precondition is not met, the Search icon will not appear. Search is always in the default language of the channel, and when a default language is not set, it falls back to English (US). 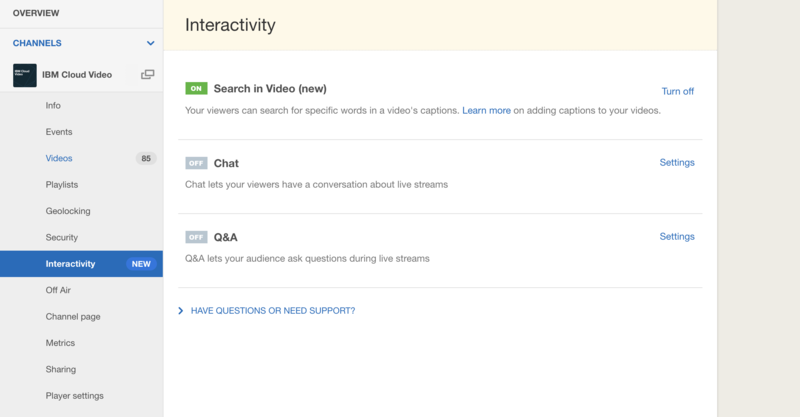 To get started with the Search in Video feature, select the “Interactivity” section under a channel. In the “Interactivity” section, click to “Turn on” alongside the Search in Video row in the list. You will get a reminder that the feature is available, only, if there are Closed Captions available in the default language of the channel. Click OK. The feature is activated, if you see the green “ON” before the “Search in Video” on the list. I activated the feature, but I can not see the Search icon in the player. Make sure that you selected a default language for you channel (How to generate transcripts for videos using Watson Speech-to-Text API – IBM Watson Media Support). After this, make sure that you have Watson Generated Captions (Watson Generated Captions for Video – IBM Watson Media Support) or VTT Closed Captions (Adding VTT closed captions files to videos – IBM Watson Media Support) uploaded for your video asset. I have selected a default language for my channel and I have closed captions for the video asset, but I still can’t see the Search icon in the video player. Generating captions with Watson takes approximately the same amount of time as the length of the video. After the Watson Generated Captions are available, it takes a couple of more minutes to have the Captions included in our search index. The same applies to the uploaded Captions as well. Please wait 3-5 minutes after you uploaded a Caption to your video asset and try again.